Anzac tribute: Students from St Joseph’s College, Gregory Terrace and All Hallows’ School prepare for their performance on the world stage. BEFORE sunlight breaks in Gallipoli on April 25, 34 young Queenslanders will let out their first note in a moving tribute to Australia’s First World War heroes and heroines. 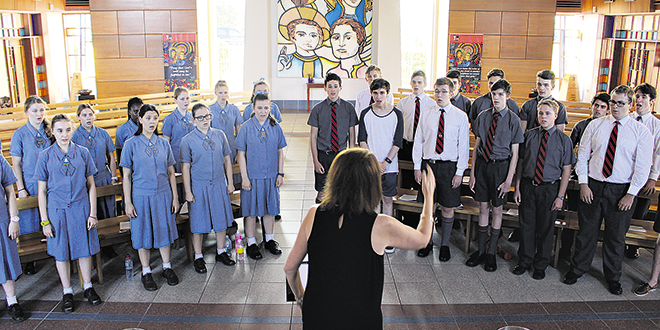 Students and alumni from two Brisbane Catholic schools, St Joseph’s College, Gregory Terrace and All Hallows’ School, flew into Turkey one week before Anzac Day to prepare for their performance on the world stage. The Terrace-All Hallows’ Gallipoli Choir was the only group chosen to sing at Gallipoli for the centenary commemorations, which will also feature the Australian Army Band and a performance with Australian musician Lior. The choir was expected to perform at five separate memorial events all before 11am on Anzac Day in Gallipoli. Fourteen young St Joseph’s College graduates fought in Gallipoli in the 9th Battalion, but seven died while on service, never returning to their families back home in Brisbane. Knowing young men once played on the school’s current handball courts gave acting culture director Matt Cocking goosebumps. Mr Cocking said the memory of Terrace’s own Anzacs would be on the lips of 17 Year 12 students who were handpicked to perform in the choir. “We’re sending 17 boys to go and sing, leaving the same soil here, and landing on the same soil, there, as the 14 boys who left Terrace and fought in the war,” he said. Choir member and Year 12 student Brendan Moran will also honour a family member who at one stage took command of the 9th Battalion. The 17 year old learnt in Gallipoli two years ago that his great-great uncle Richard Henry Walsh, a devout Catholic, was in the rank of major during the war. Major Walsh was in his 40s, married with three children, when he enlisted in the AIF to become what his daughter called “a real Anzac”. He was mentioned in dispatches during a battle in June 1915 for having “commanded his company though twice wounded until his company was withdrawn”. The company had gone out with 80 men and returned with only six. Major Walsh took command of the 9th Battalion on September 9, but illness meant he returned to Australia after six months and was ordered to train soldiers at Enoggera until the war ended. His family eventually became a regular parishioners at St Benedict’s Church, East Brisbane. He died on the Feast of the Assumption, August 15, 1949. At his funeral, Archbishop James Duhig, who was a close family friend, preached about the heroic man, and said “his name and memory will be honored for generations to come”. His great-great nephew, Mr Moran could not agree more with the former Brisbane archbishop. “Gallipoli is moving,” Mr Moran said. “I remember standing and looking at the graves, and realising the guys there are eternally my age. They called the war and these young men rushed off.